How can we make it easier for schools to develop strong partnerships with families to improve educational outcomes for all students? The Right Question School-Family Partnership Strategy is an evidence-based approach that strengthens parents' capacity to ask better questions, participate more effectively in decisions, and partner more productively with schools. Parents who can confidently ask better questions and participate in decisions affecting their children's education begin to play three roles that allow them to partner more constructively with educators: They support their children's education, monitor their progress, and advocate for them when necessary. 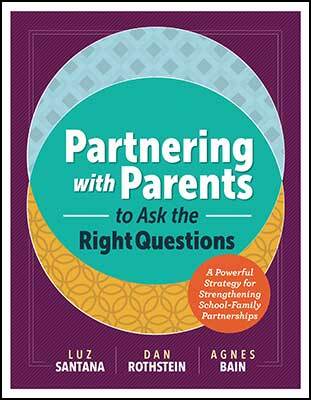 Join Luz Santana and Agnes Bain, founders of the Right Question Institute and coauthors of the new ASCD book Partnering with Parents to Ask the Right Questions: A Powerful Strategy for Strengthening School-Family Partnerships, in an engaging webinar where you will learn to use one component of the Right Question Strategy: The Question Formulation Technique. This component is a process for producing one's own questions, improving the questions, and strategizing on how to use them. Reflect on the value of the strategy for strengthening partnerships with families and improving outcomes for all students. Luz Santana is the codirector of the Right Question Institute and the coauthor of Make Just One Change: Teach Students to Ask Their Own Questions (2011). Agnes Bain Agnes S. Bain is a lifelong resident of Lawrence, Massachusetts, and began work with Luz Santana and Dan Rothstein when she was a parent of children in the Lawrence public schools system.